Hedge funds and large money managers usually invest with a focus on the long-term horizon and, therefore, short-lived dips on the charts, usually don’t make them change their opinion towards a company. This time it may be different. During the fourth quarter of 2018 we observed increased volatility and small-cap stocks underperformed the market. Hedge fund investor letters indicated that they are cutting their overall exposure, closing out some position and doubling down on others. Let’s take a look at the hedge fund sentiment towards Open Text Corporation (NASDAQ:OTEX) to find out whether it was one of their high conviction long-term ideas. Open Text Corporation (NASDAQ:OTEX) was in 20 hedge funds’ portfolios at the end of December. 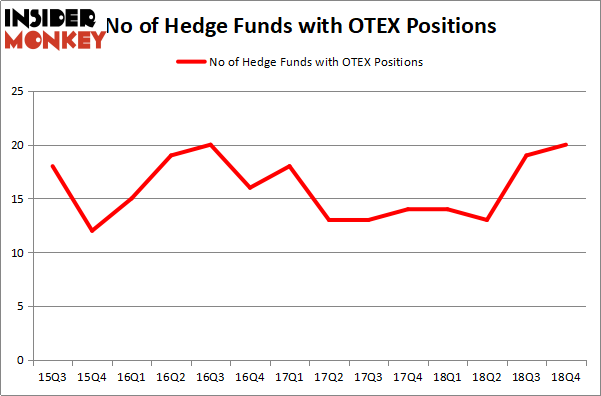 OTEX shareholders have witnessed an increase in hedge fund sentiment lately. There were 19 hedge funds in our database with OTEX positions at the end of the previous quarter. Our calculations also showed that OTEX isn’t among the 30 most popular stocks among hedge funds. We’re going to take a look at the fresh hedge fund action regarding Open Text Corporation (NASDAQ:OTEX). What does the smart money think about Open Text Corporation (NASDAQ:OTEX)? At Q4’s end, a total of 20 of the hedge funds tracked by Insider Monkey held long positions in this stock, a change of 5% from the previous quarter. By comparison, 14 hedge funds held shares or bullish call options in OTEX a year ago. With hedgies’ capital changing hands, there exists a select group of noteworthy hedge fund managers who were boosting their stakes significantly (or already accumulated large positions). More specifically, Blue Harbour Group was the largest shareholder of Open Text Corporation (NASDAQ:OTEX), with a stake worth $321.3 million reported as of the end of September. Trailing Blue Harbour Group was Praesidium Investment Management Company, which amassed a stake valued at $136.1 million. Arrowstreet Capital, Sunriver Management, and AQR Capital Management were also very fond of the stock, giving the stock large weights in their portfolios. Now, specific money managers have jumped into Open Text Corporation (NASDAQ:OTEX) headfirst. Stevens Capital Management, managed by Matthew Tewksbury, initiated the biggest position in Open Text Corporation (NASDAQ:OTEX). Stevens Capital Management had $1.3 million invested in the company at the end of the quarter. Matthew Hulsizer’s PEAK6 Capital Management also made a $1.2 million investment in the stock during the quarter. The other funds with new positions in the stock are Matthew Hulsizer’s PEAK6 Capital Management and Gavin Saitowitz and Cisco J. del Valle’s Springbok Capital. Let’s now take a look at hedge fund activity in other stocks similar to Open Text Corporation (NASDAQ:OTEX). These stocks are PerkinElmer, Inc. (NYSE:PKI), Federal Realty Investment Trust (NYSE:FRT), Equity Lifestyle Properties, Inc. (NYSE:ELS), and Mohawk Industries, Inc. (NYSE:MHK). This group of stocks’ market valuations are closest to OTEX’s market valuation. As you can see these stocks had an average of 20.75 hedge funds with bullish positions and the average amount invested in these stocks was $838 million. That figure was $617 million in OTEX’s case. Mohawk Industries, Inc. (NYSE:MHK) is the most popular stock in this table. On the other hand Equity Lifestyle Properties, Inc. (NYSE:ELS) is the least popular one with only 15 bullish hedge fund positions. Open Text Corporation (NASDAQ:OTEX) is not the least popular stock in this group but hedge fund interest is still below average. This is a slightly negative signal and we’d rather spend our time researching stocks that hedge funds are piling on. Our calculations showed that top 15 most popular stocks among hedge funds returned 21.3% through April 8th and outperformed the S&P 500 ETF (SPY) by more than 5 percentage points. Hedge funds were also right about betting on OTEX, though not to the same extent, as the stock returned 17.9% and outperformed the market as well. Were Hedge Funds Right About Flocking Into Altice USA, Inc. (ATUS) ? 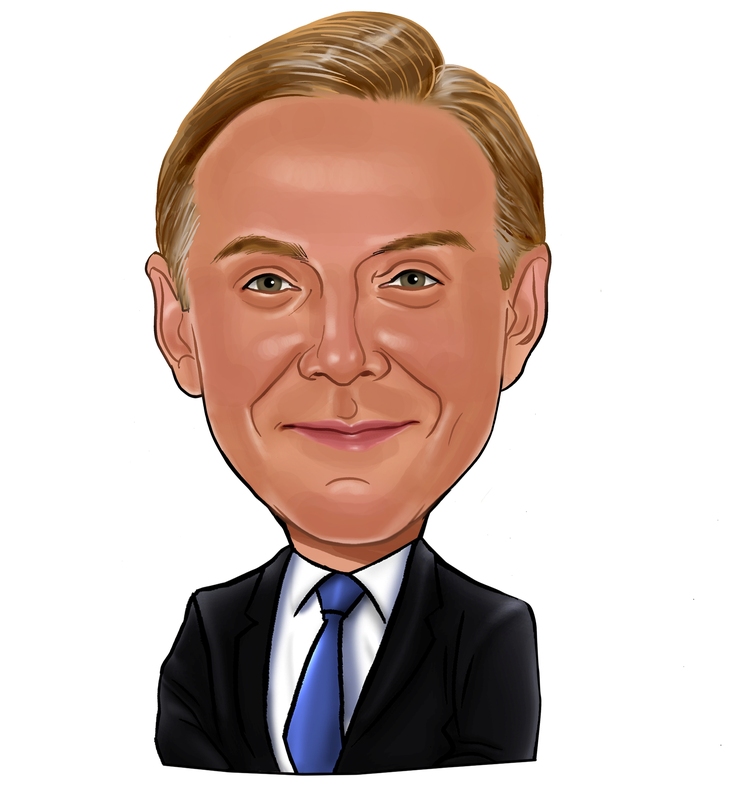 Here’s What Hedge Funds Think About IDEX Corporation (IEX) Here is What Hedge Funds Think About Jack Henry & Associates, Inc. (JKHY... Were Hedge Funds Right About Souring On WestRock Company (WRK) ? Here’s What Hedge Funds Think About The Gap Inc. (GPS) Did Hedge Funds Drop The Ball On Kansas City Southern (KSU) ?